Stoke-upon-Trent, is as it was, motionless. Why isn’t Stoke the city centre? Like many focal towns it stands at the head of a river and is the axis of civic administration. The university is here, so is the main railway station. The HQ of the Potteries Manufacturers’ Federation is here, at least two of the most internationally famous potteries export from here. The centre of community medicine, the A&E and ICU reside close by and on top of all this the town carries the region’s identifiable name. Historically it was an important stockade and an inland port as far as the currents of the River Trent could reach, and its physical outlook really does have more going for it than any of the other five towns that make up Stoke-on-Trent. So why does Stoke have such a hard time with its identity? One of the problems is its name. I mean why is it loaded down with this silly and confusing name that no one ever uses – Stoke upon Trent? What a dainty moniker it sounds when spoke – “H-eigh come from Stoke upon Trent, don’t you know,” you can’t imagine any worthwhile Stokie saying this can you? And can you just picture the boys from the Boothen End outside the London East End Den dipping their wrists to a polite Millwall mob when asked – “H’is it a naice place Stoke upon Trent?” “Ho yes, quaite refained h’it is. Next time we play you we’ll give you a look around.” This said just before the fleet of ambulances arrive to convey the sudden torrent of casualties to London’s hospitals. Stoke upon Trent? Ditch it h’eigh say! The federation of the six pottery towns, four of which were county boroughs in 1910, brought with it an irresolvable community problem. How, for instance, do you get to know people who live on the far side of the district, say Tunstall, when you hardly know anyone in the next street? Before 1910 each town had its own civic administration and looked after itself. The growth of the Potteries embodied 300 years of an indigenous industry whose ovens demanded vast quantities of disposable human resources; and so early death effectively put a stop to neighbourliness outside the immediate row of worker’s terraces. Seen in this way Stoke, the town, is no more than just another part of the featureless conurbation that is situated just over the hill from the ‘Loyal and Ancient’ borough of Newcastle under Lyme and on the other side of the A500, the main Potteries’ bypass to the region’s natural city centre of Hanley. Today Stoke town centre terraces seem mostly to be occupied by students and an enlarged community of ethnic settlers mostly Asians. I guess it is obvious that the fragile working communities have moved on along with the closure of the major potbanks, the transfer of Stoke City FC to Sideway. The town with a paradoxical name has become something else – another place. In 2004 I went to meet Phil and Linda Proud and their two boys Nick and Sam. They are a family that has lived at the back of the former Victoria Ground in Birks Street for twelve years although Linda herself is a born and bred Stokie. Nick is the eldest son and at 15 is studying music at Thistley Hough School. He is planning to qualify for the National Academy of Music in Manchester and sees himself leaving the district. He mentions the market hall that burned down in the 1980’s and thinks that it would have been a good opportunity to have moved on with more modern architecture with features that are appealing to the young rather than patronizing to the old. Actually Sam’s call for skateboarding facilities and other recreational pursuits sounds fine to me. I never given much thought to any commercial by-product of such extramural activity until I was told that each week Sam, Linda and Phil take off for Stockport where there is a purpose-built indoor arena for skateboarders – not that Linda and Phil partake in such energetic activity themselves but – and this is the point – during the couple of hours while Sam is practicing his double flips his mum and dad are visiting Stockport’s shops, buying special items and even groceries – get it? It doesn’t take much working out that if Stoke had some major attraction like an indoor simulated mountaineering complex, or a full-size skating rink, the benefits to retail trade would be quite impressive. And where to put such a facility – as Sam advocates, on the Victoria Ground, where else? What a brilliant site. 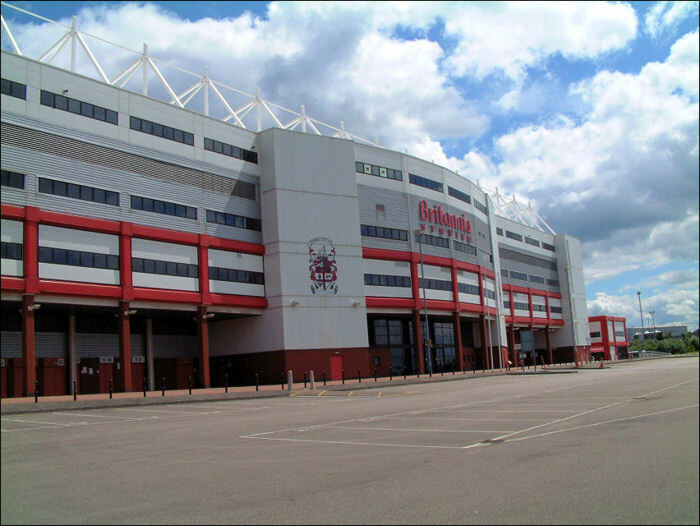 Stoke City FC controversially moved to the Britannia Stadium in 1997 to share, so the deal was agreed, its location and its facilities with the community. Perhaps the Britannia Stadium would have been an ideal place to have a skateboarding area? And imagine using all those stadium facilities for regular community events, experiences that would draw people to Stoke from outside the region – drop the kids off safely and then use a park and ride scheme to bus parents around the Potteries? I mean the Britannia Stadium is a community centre isn’t it? Didn’t we contribute £3.1 million from our council taxes to pay for it? Surely then this is a great location for Sam and his mates? “No,” says Sam glumly, “You can’t even get on the car parks even when there isn’t a match on. Security wardens patrol it all the time to chase kids away.” So, no skateboarding then at the Britannia Stadium! I wrack my brain to recall some special event there over the past six years and I come up with a blank. Oh, of course there’s football and there’s been the odd pop concert, the kind of events that are restricted to minority groups. So where’s the value for our £3.1 million when the massive majority of Stoke-on-Trent people from Tunstall to the Meir – skateboarders as well – are excluded? 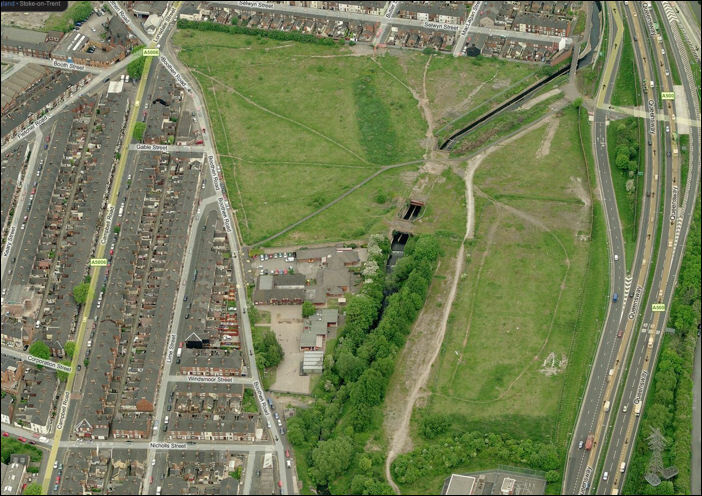 The site of the former Victoria Ground is wasteland (2004 and remains so in 2011). The River Trent flows fast along its eastern perimeter but the water looks unclean and it smells badly. Rats breed here and the depth of the concrete-lined sides prohibit human approach to the bank-side shamefully making the River Trent, as it passes through Stoke town, a no-go area. And yet with a bit of thought and planning what exciting potential this location could have. Fed up residents are really angry about the delays over any redevelopment here. Graffiti scrawled on the concrete walls at the old Boothen End pleads ‘No sheds here!’ ‘Houses not retail!’ But there are houses going up all round Stoke. Some of the Michelin factory site has been taken over by housing and across the road in Sideway is Trentham Lakes Business Park. 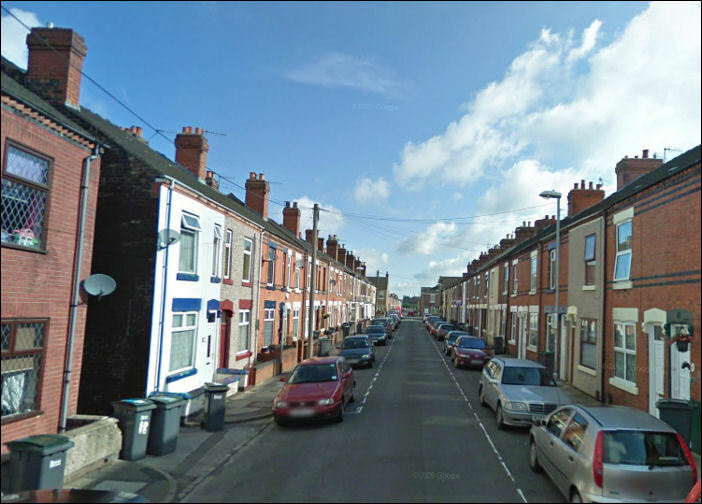 It seems that Stoke is being compressed by development, and yet those who live in the terraced streets, like the Proud family, are becoming more oppressed by the swamping of available land with cheap housing and retail warehouses instead of the rising of something unique, something special. “The town as a community no longer exists,” says Linda. “I grew up here and I’ve seen it completely lose its community traditions and values. People once used the town and its shops and its places of entertainment every day. Now it is quiet in the day, but at night it’s a ghost town. Nothing moves after six o’clock. Phil Proud was brought up in Newcastle and says there’s no comparison between the two towns. So, I decided in 2004 that if Stoke town is to thrive or even survive, perhaps it should look to develop its distinctiveness and drop all thoughts of big-town pretence. Linda thinks there are already too many houses in the district so perhaps the best way for Stoke to develop is to clean up the River Trent and utilise its embankment. Expand the Victoria Ground site into an attractive leisure park using the river as a feature and maybe Sam and his mates can get their skateboarding amenities there as well. Oh, and for goodness sake, let’s drop that limp-wrist name at least until we can first make it look and then sound like Stratford upon Avon or Henley on Thames.